Tetris Blitz iPhone, iPod Touch, and iPad app is a two minute race to fill as many rows as possible with bright, familiar Tetris blocks. The game play includes fun features and power-ups to amplify your gaming experience and earn more points. The Tetris Blitz iPhone app has a straight-forward video game interface. The gesture controls are simply explained in pop-ups, as you jump straight into playing the game. A string of blocks enters at the top of the screen, and you can find several possible positions outlined at the bottom of the screen. You tap the icon at the preferred position, and the top shape drops to fill the space. When you fill the line with blocks, the line disappears and you earn points. The grid may drop additional blocks, as the game scape reshapes. Four icons frame the grid where the action of the game occurs. You can tap hold, cycle, see the next shape, and power-ups. The cycle icon is the most useful icon. You can tap the cycle icon, and the possible positions of the blocks are adjusted. It’s fun, easy, and familiar. As you progress, different game modes and power-ups are introduced. 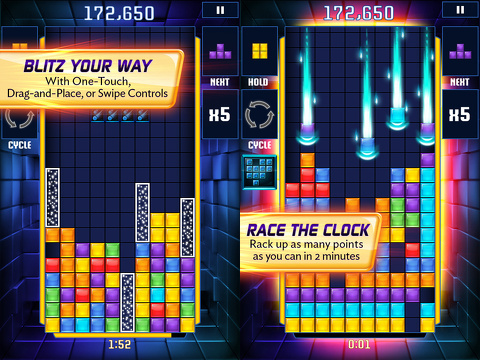 A frenzy mode accelerates the speed and increases the lengths of the blocks. Additional power-ups include quake, lasers, and time shift. The power-ups certainly made it easier to earn more points, but their impact on the gaming experience was fairly limited. I do, however, enjoy the magnet power-up. When you have completed a row, the remaining blocks on the screen regroup more tightly. You can earn points faster, as you eliminate the random missing blocks. You can purchase power-ups from the in-app store as well. The key to quick success is to pay close attention to the possible spaces for your blocks to land. If you can quickly tap the cycle button to change position, then you will be a Tetris Blitz iPhone app champion quickly. 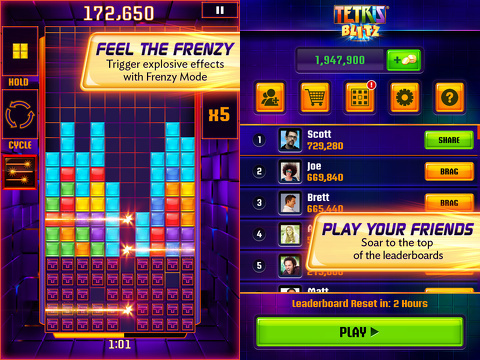 The Tetris Blitz iPhone app is free, but it is supported by ad banners and in-app purchases. Like many free iOS games, you are offered chances to sync with Facebook and do different social activities between games. It is a solid, fun, and accessible game. AppSafari review of Tetris® Blitz was written by Jenni Ward on May 30th, 2013 and categorized under App Store, Free, Fun, Games, iPad apps, Puzzler, Universal. Page viewed 4460 times, 1 so far today. Need help on using these apps? Please read the Help Page.